Successfully Added GPS Unlocked Cellphone with 3.2 Inch Resistive Touchscreen to your Shopping Cart. Global positioning system in the palm of your hands! 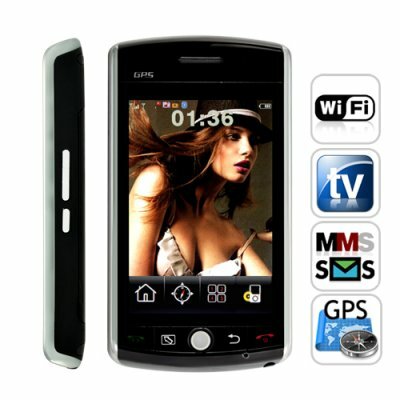 This GPS cellphone is the latest innovation to emerge from the worlds leading consumer electronics provider. Perfect for drop shipping and reselling on eBay, this GPS cellphone also comes with the most sought after functions today’s power mobile user expect from their PDA handsets such as: Dual SIM, TV, WiFi, FM Radio, MSN, Facebook, Opera mini... and much more! This GPS Cellphone is a powerful PDA/Smartphone with a crystal clear LCD resistive touchscreen screen, weighing less than the Nokia N97 making it for comfortable to carry this GPS mobile around with you in your pocket. This carefully designed top quality China cell phone will give you unprecedented user experience that will satisfy even the most demanding cell phone expert. With its intelligent menu interface designed to allow for the most simple and easy understanding of navigation even for the average mobile phone user. GPS BONUS OFFER: Chinavasion has FREE GPS software and maps available for the following countries: Bulgaria, Spain, Portugal, UK. This GPS mobile phone is built specifically to meet today's heavy communication/PDA/Multimedia demand, and best of all, it comes with Chinavasion's famous wholesale price. So order yours right now, and we'll express ship you a sample straight away! Where Can i get additional GPS maps for this GPS cell phone? Maps for ARGENTINA, BRAZIL, CHILE, MEXICO, RUSSIA and URUGUAY are available from our customer service department after each GPS Mobile Phone purchase. For more GPS maps please visit - http://download.chinavasion.com/GPS+Maps. How do I install the GPS maps? To install additional maps on this GPS cellphone, connect this GPS mobile to your computer open the folder within the MicroSD card "SunaviMapData", then copy the downloaded GPS map into the folder called "Maps". Once in maps, open the "MultiMap.tab" file using "Note Pad". Now, to activate the GPS map that you have moved into the Map folder, find the line of CODE that contains the name of the country for your GPS MAP, then delete the HASH "#" in front of the code, then save and exit. Now you should be able to find the MAP in the MPA switch option withing the GPS settings of this GPS cellphone. Does this GPS cellphone come with any other Maps, other than the pre-installed ones? No, this GPS mobile phone only comes with the pre-installed GPS maps.